The Lady Vanishes was one of the last films Hitchcock made in Britain before moving to Hollywood. Apart from this, I have only seen The Man Who Knew Too Much and The 39 Steps from his Brit period and there's a fair degree of similarity between these films, mainly in the relatively frothy carefree spirit that embodies them, and the typical British deadpan humor. The first act of the film, set in a crowded resort of a fictitious European country where we are introduced to most of our main cast, is primarily a comic act with some racy verbal humor. Apart from Iris (Margaret Lockwood) and Gilbert (Michael Redgrave) whose spicy spats only convince us they'll be in love before long, there is the archetypal sweet old spinster Miss Froy and the cricket crazy schoolboy-minded stiff-upper-lip duo of Charters and Caldicott. This act concludes with the characters getting on a train as they journey to London. The second act occurs almost entirely in the confines of the train (shot fantastically on a small stage with use of miniatures, rear/front projection, shaky movements to mimic the train's motion...every trick in the book). Iris, who has received a knock on the head from a mysterious falling flowerpot at the station and made good friends with Miss Froy, falls into deep sleep and wakes up only to find that sweet old lady gone. What's more, no one in the train, including the staff and fellow passengers, is willing to admit to the presence of such a person, insisting that Miss Froy is a figment on Iris' imagination. The headstrong girl, even as she starts to doubt her own sanity, is only more determined to dig deeper into the matter for which she must take flighty Gilbert's help, even if he doesn't entirely believe her. This act is classic Hitchcock suspense, with clever sleight-of-hand and deliberate misdirection. While the plot isn't hard to figure out, it's smoothly executed and a delight to watch. There's a canny mix of humor and thrill in the unfolding that engages the senses and keeps the mind from asking those pesky questions about plausibility. The third act is the rip-roaring off-the-rails (heh) climax, where much mayhem ensues before (British) good triumphs over (foreign) evil. So what we have here is an easily palatable adventure, but with those delightful character touches and deft writing that raise it well above the norm. Parallels have been drawn between the depiction of the British characters in the film, how they choose to ignore Iris' suspicions in favor of "just getting on with it", and how the British government initially dealt with Hitler and the rise of Nazism. The observation does seem relevant, although it is not a necessary component of one's enjoyment of the film. 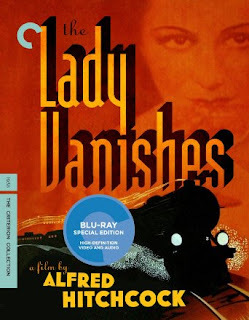 A few words on Criterion's blu-ray. The video quality is excellent for a 1938 film, with good contrast, grayscale and fine detail. The mono sound is limited but effective. Extras include a decent critic's commentary, a video essay on the film, a short audio excerpt from the Hitchcock-Truffaut sessions..and yeah, an entire other film - Crook's Tour - featuring the duo of Charters and Caldicott (I saw some 15 min of that and got bored).